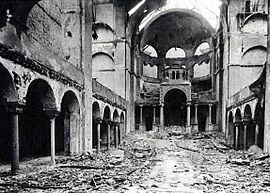 Kristallnacht is a German word meaning, Kristall (crystal, glass) nacht (night). It is also known as ‘The Night of the Broken Glass“. It was the night of the planned Nazi attack to destroy the property of the Jews, nationwide. In this one night of terror, 1,250 synagogues were burnt to the ground or destroyed; overe 91 Jews were killed; 30,000 Jews were thrown into concentration camps; 7,000 Jewish businesses were destroyed; and thousands of Jewish homes were ransacked. This night was November 9, 1938. On the Hebrew calendar it was Cheshvan 15, 5799. This year it fell on October 23, 2010. Below are photos of a burned out synagogue in Berlin and headlines from the NY Times. The European Jewish Congress warns that a recent wave of anti-Semitism, some of which was officially sanctioned, has left Jewish communities in grave danger. EJC President Dr. Moshe Kantor sums up: “We are entering a very dark period for Jews in Europe.” Recent instances of official anti-Semitism, of which there have been a number, include an event that occurred in Antwerp, Belgium. A respected government-funded Catholic school hosted a “Palestine Day,” replete with anti-Semitic references and activities for youngsters. One stall at the event was entitled “Throw the soldiers into the sea,” and children were invited to throw replicas of Israeli soldiers into two large tanks of water. Last weekend, an event organized for Jewish children in Malmo, Sweden, was attacked by a gang of thugs who shouted “Heil Hitler” and “Jewish pigs.” The gang entered the site of the event and damaged property. The EJC has called on European governments and the EU to launch a campaign against intolerance and anti-Semitism. In England, France and the Netherlands Jews are now afraid to let their Jewish identity be known in public. Jewish men are wearing hats instead of their Kippots (Yarmulkes) in an attempt not to be attacked on the streets by Islamics and neo-Nazis. It is easy for us to look back at the Holocaust and ask ‘why didn’t people do something’? Let me ask you, What are you doing? Are you speaking up? Are you being heard? Bad things happen when good men do nothing.